Modular building, already popular in Europe, is on the rise in the United States. 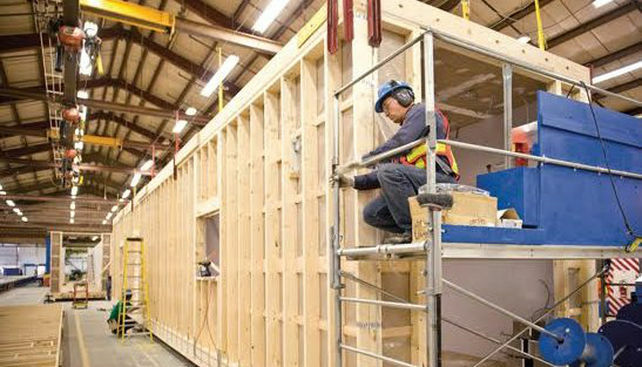 If you’re not already familiar with this method of construction, going modular means that you manufacture modules of a building off-site (in a factory), then transport these pre-fabricated units (sometimes called “boxes”) to the building site. Then you assemble the building on-site. The process saves significant time, decreases material waste, and increases quality control, efficiency, and worker safety. A 2013 study conducted by the Modular Building Institute showed modular building projects increasing in number by 31% each year, though at this point modular construction accounts for a small percentage of total construction. Nevertheless modular building has become more and more popular in apartment complexes, along with educational and retail/commercial facilities. It’s even catching on in healthcare and office projects. Conventional construction methods haven’t changed much in the last 100 years. It’s certainly time for new ideas to shake up the market. So what’s so exciting about modular building, and why should we be paying attention to this trend? Modular construction can reduce your total schedule by 20-30%. “The Domain,” a 444-unit luxury community in San José developed by Equity Residential, was completed in 2013, nine months ahead of conventional schedule, and fully occupied a year before conventional schedule. “The Stack,” a seven-story apartment building in New York (designed by Gluck+, manufactured by Deluxe Building Systems) was recently built using modular methods. Once the nearly 60 units were manufactured and transported, this building was assembled in 19 days. Yes, 19 days. Think about it – if you are constructing these units in a factory, you have a controlled setting where you can achieve both consistency and quality. Instead of being at the whim of nature and the elements, manufacturers wield more control over essential details. Almost everything can be done in the factory – modules arrive to site essentially habitable. Walls painted, floors installed, kitchens outfitted with counters, cabinets, and appliances. Even electrical systems are ready to go. Because of this careful manufacturing process, material waste is greatly diminished. Worker safety improves, because there are fewer chances for on-site accidents. The process also allows for greater energy efficiency and more sustainable developments. At least right now, construction costs can be higher for modular building. However, that doesn’t mean going modular doesn’t make financial sense. Let’s look at “The Domain” again. That construction did cost about $2 million more than if it had been conventionally constructed. However, the fast timeline resulted in $15 million more in gross revenues, a pretty impressive return on investment.